After all the excitement of your wedding, you’ll be happy to get on “island time” with your Cook Islands honeymoon. Perhaps you’ll start with a sumptuous, private, candlelit dinner on a white sand beach or by snorkeling the crystal clear waters of one of the warm, azure lagoons fringed by curving palm trees. Shoppers will love the diversity of pupu necklaces, hand-painted pareus, bikini bras, carved wooden bowls and the precious black pearls that the Cook Islands are famous for. Take a trip out to the local villages and learn about the Polynesian ways at one of the dinner and dance shows. Or for cultural experience you’ll never forget, take an island walk with Pa, the amazing medicine man, as he shows you the secrets of the islands. If you’re looking for some action, try quad-biking or deep sea fishing or head to one of Ayarua’s open air bars and nightclubs. 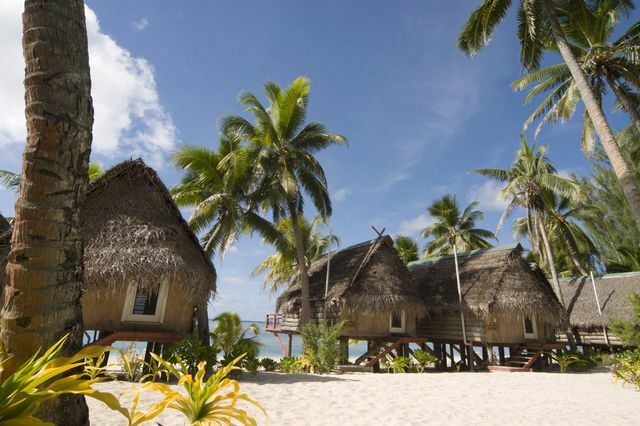 Rarotonga in the south is green and volcanic, with plenty of shops and opportunities to go hiking whilst Aitutaki in the north is a coral atoll with a stunning blue lagoon, the perfect backdrop to a honeymoon in paradise. A ferry between the two takes 18 hours and is infrequent whilst a flight takes just an hour but can be expensive if not booked far in advance so make sure you put together a plan. Get started planning your Cook Islands honeymoon! There is never a bad time to enjoy a Cook Islands honeymoon. It’s sunny all year round and even in rainy season (December to April) most of the rain comes in short, heavy bursts followed by sunshine. It does lie in the Pacific Hurricane Alley though so just be aware that for the lower prices and less people, there is a risk. Late June to August is the busiest time but you’ll still never feel crowded. April to May and September to October are usually the best combination of sunshine and lower prices. Cook Islands Christian Church dating from 1841. Hike Muangapu: This is the highest point on Aitutaki at 124m and in just 30 minutes, you’ll be at the top admiring the breath-taking views over the lagoon. FH and I are thinking of going to the Cook Islands via Costco Travel for our HM. I was wondering if anyone on here has been? Do you have any advice, or must-dos? TIA! Has anyone used Costco Travel? Or been to Cook Islands?